"It was a war, and Barca won it," said the front page of sports daily AS, while Marca declared "Barca won the derby". 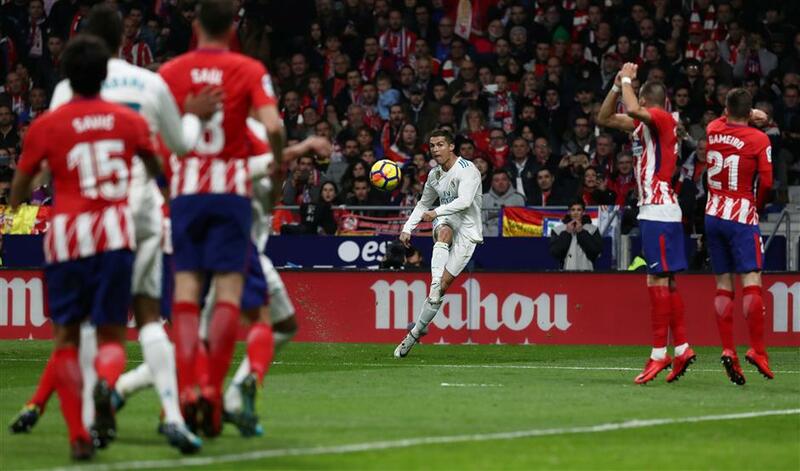 Real Madrid’s Cristiano Ronaldo shoots at goal during their Spanish league match against Atletico Madrid at the Wanda Metropolitano stadium in Madrid on November 18, 2017. The derby ended goalless. Barcelona was declared the true winner of the Madrid derby by the Spanish media on Sunday as the thrilling yet low-quality stalemate between Atletico and Real Madrid left the Catalans enjoying a 10-point lead over the two sides in La Liga. Barca won 3-0 at Leganes on the outskirts of Madrid, before a bruising yet goalless first capital derby at the new Wanda Metropolitano stadium saw tempers flare all over the pitch and left Real captain Sergio Ramos with a broken nose. The cover of Barcelona-based daily Sport also focused on Ernesto Valverde's side and its considerable lead over the two Madrid rivals, headlining its edition "10 points clear — Barca strike a blow towards the title". There was little mention of Barca's nearest challenger Valencia, which can reduce the gap on the Catalans back to four points if it beats Espanyol on Sunday, a week before a top-of-the-table clash between the two teams at the Mestalla. The editorial of AS criticized the approach of Atletico and Real in the derby. "They were obliged to win, especially Real. That sensation could be felt in the atmosphere before the game but not during it. Neither side truly believed in themselves," it said. Atletico forward Angel Correa missed a gilt-edged chance three minutes into the game while substitute Kevin Gameiro almost found a winner but was denied by a goalline clearance from Real's Raphael Varane. Toni Kroos and Cristiano Ronaldo wasted Real's best efforts as Zinedine Zidane's side finished the game stronger, threatening Jan Oblak's goal in the final few minutes but to no avail. Newspaper ABC was more impressed by the performances of the Madrid sides. "As you would expect, Atletico and Real Madrid engaged in a dog fight. Barcelona raced further ahead, and the only consolation is the teams put in good performances." Real defender Varane said: "I'm disappointed because we played well, we defended well and created chances but we lacked a bit of luck in front of goal. "We know we've got no margin for error left now. We're professionals and we're going to give everything to make sure we get as many points as we can." Atletico midfielder Saul added: "We are hurting ourselves by not scoring as once we go ahead we're very difficult to beat. We just keep on missing clear chances." Elsewhere, Sevilla recovered from its loss to Barcelona in the previous round by beating Celta Vigo 2-1 to move back to fifth place. It was the fourth win in five matches for Sevilla in all competitions. Getafe defeated Alaves 4-1 at home, handing Alaves a 10th league loss. "Our performance was embarrassing," Alaves coach Gianni De Biasi said.